For far too long, online business owners have been killing themselves by creating so much content in hopes of becoming more visible online. But you know what's missing in all of that content? A content strategy. Strategically creating the right types of content on the right platforms for the right audience will not only save you time, but it will help you be more visible and reach more of your target audience! A content strategy not only means you can get away with creating LESS content, but you will end up being MORE VISIBLE online! 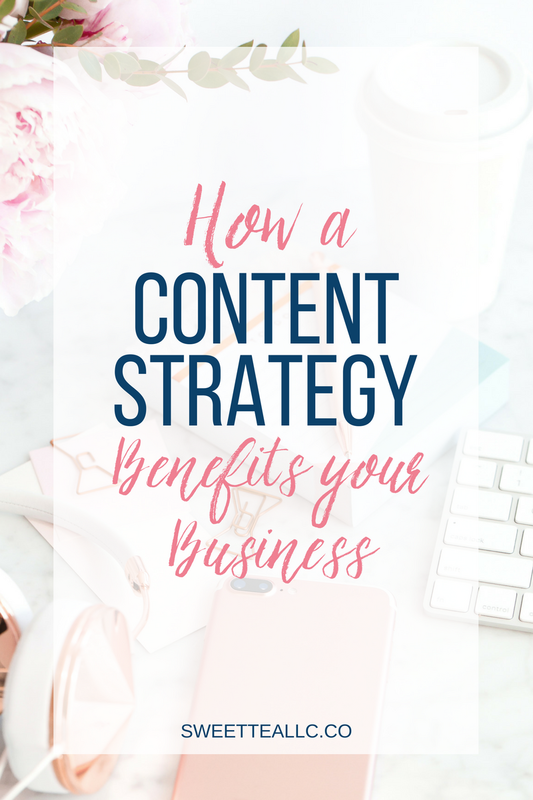 You won't believe how a content strategy can benefit your business - read the full post to learn more! The thought of actually taking the time to create a content strategy for your creative business might seem daunting, but the benefits far outweigh the work needed upfront. Alright, let's get down to business, shall we? We all know that, as business owners, we have to invest in our businesses in order for them to grow. Sometimes that investment is money, while other times it's a time investment. And you want to make sure your investment has a good ROI, am I right? So what is the ROI of an effective content strategy? #1 - Your content reaches more of your target audience. That's the whole "visibility" thing we keep talking about. When you take the time to truly define your target audience, you can actually create content that meets them where they are. What is their day-to-day life like? Ultimately, your content should solve a problem for them, or help them overcome some frustration in their life. Your content should also be easily consumable. For example, my target audience is you - the busy business owner. You may not have time to read long blog posts every day or so, but you can easily pop in your earbuds and listen to a podcast episode. Bite-sized content in various formats allows you to reach your audience in whatever capacity suits them best. #2 - Your content, and ultimately, your business, will rank higher in search. Your business, namely you, are an expert or authority on specific things, right? Those things are what you should be ranking on page 1 of Google search, meaning that organically, more people will find your business. When you take the time to identify the key areas of your expertise, and consistently incorporate these into your content strategy, you will eventually rank higher on search for those things. You break your content into 4 main categories, all of which are related to your overall business. You write one piece of cornerstone content for each category. This cornerstone content is an epic, in-depth, written blog post that gives an overview of everything you know about that particular category as it relates to your business. You optimize the crap out of it for whatever keyword phrase you want to rank for. Every related piece of content you write links back to that piece of cornerstone content, as well as any relevant guest posts you do. That big piece of cornerstone content builds your site up as authority on that particular keyword phrase, and the more follow links you have going INTO those pieces helps boost the search ranking of those pieces of content. #3 - A content strategy means you create LESS content. Now I've got your attention, right? When you take the time to create an effective content strategy, ultimately, you should end up creating LESS content. And yes, you'll have MORE visibility because of it. Let me give you the cold, hard truth about your audience: Not a single one of them reads, listens to, or watches every piece of content you publish. This is a slide from my course, "Content Strategy with a Brain", and it explains my point perfectly. If you'll notice, the month has a theme, and I've broken down my calendar into categorized weeks, representing each category of my website. Next, I've assigned each day of the week a particular type of content, like a YouTube video, a podcast episode, and so on. As you can see in the outline above, I recorded one video as my "master" piece of content. I then pulled the text and turned it into a written blog post. The audio became a podcast episode. I pulled out a few snippets of the video or quotes from the text and made those into several social media graphics and videos, and I even expanded upon the post as a list-building free ecourse. Finally, I talked about it in my newsletter and my Instagram stories, and pinned images from the post to Pinterest. 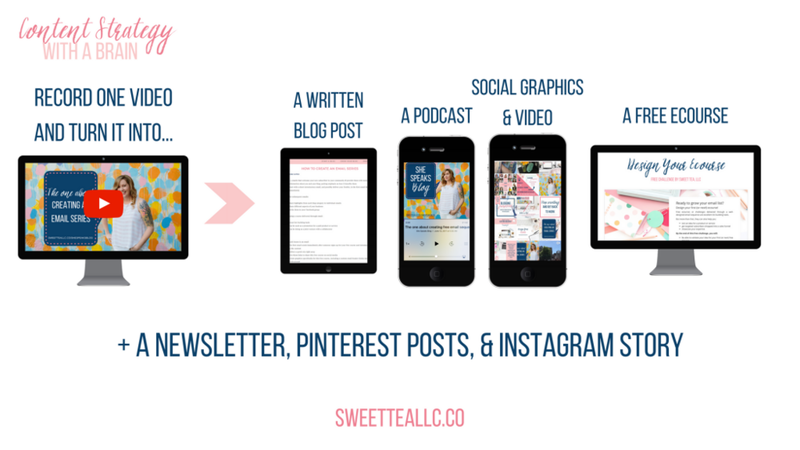 Are you starting to see how incredible a content strategy is for your business? When you don't have to spend so much time creating content, you can spend more time actually running your business, working with clients (making more money! ), and being the awesome boss you are meant to be!